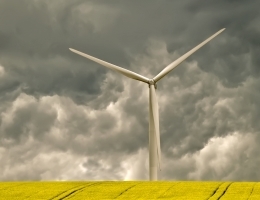 Wind turbines harness the power of the wind to generate electricity. Obstructions such as trees and buildings will reduce the efficiency of a wind turbine. The maximum output from wind energy systems is in the winter, which coincides with the maximum power usage in a property, but there can be prolonged periods of winter calms when there is insufficient wind to generate power. Wind speed is not uniform across the country so not every region in the country can gain maximum benefits. The capacity factor, the typical generated power over the course of a year, is about 24% of the theoretical maximum output for onshore and 41% offshore. The average size onshore turbine powers around 1,500 homes with 50 metre blades generating 2.5-3MW. The average wind speed on a site should be at 5 metres per second (11mph) for wind power to be viable. Higher average wind speeds are desirable as the energy available is proportional to the cube of the wind speed. Obstructions from buildings and trees reduce wind speeds and cause turbulence. Locate a turbine in a clear space at a distance of at least 10 times the height of any obstacle. A viable 2.5 kW wind turbine installation should generate the equivalent to an average household´s electricity consumption (4,000kWh pa), yet peak power demand can exceed 10kW in many dwellings. A 6kW turbine on a 12m pole-mounted system will cost around £23,000 and generate 6,000 to 10,000kWh per annum dependent on average wind speed. These have a rotor diameter of 5-6m.